(Photo by Fernando Barron II) A doctor (Ernesto K. Gonzalez) tries to treat Diana Goodman as the rest of the cast sings. (Photo by Fernando Barron II) Skillful lighting by Sierra Shreves helps create a variety of effects. Christopher Alvarez, Sabrina Lynn Gore and Johnbarry Green appear in this scene. 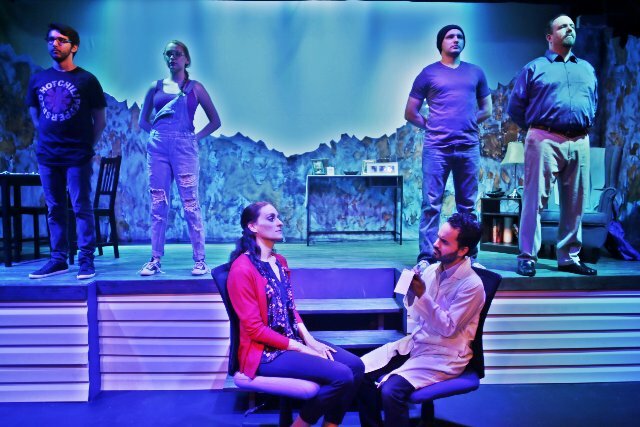 A current South Florida co-production of the Pulitzer-Prize-winning musical Next to Normal is nearly next to perfection. The performers earn every tear, sniffle, gasp and laugh. That became clear during the opening night performance of this heart-shattering, drily humorous, touching production. This co-mounting between Infinite Abyss Productions and Measure for Measure Theatre Company runs through June 3. Director Daimien J. Matherson wrings every ounce of passion, pathos, wry humor, vulnerability and sensitivity from the talented six-member cast. Matherson has developed a clear approach. The characters don’t only speak to each other. At times, at least one, merely inches away from us, addresses the audience as though we’re part of the musical’s world. Characters sometimes enter from the audience seating area. The take-home message is clear: Mental illness affects each of us, directly or indirectly. This potent co-production will imbue you with hope even as it makes you breathless with sobs. Certainly, the Abyss auditorium’s intimacy helps create a visceral, heart-breaking experience. But don’t shortchange the technical team or the performers. The actors’ expressive and strong singing matches their ability to fully inhabit their characters. These actors are playing the hurting individuals populating the world of Next to Normal, a heart-tugging rock musical. It dares to venture into dark, complicated subject matter that we’ve repeatedly seen the likes of Stephen Sondheim tackle. This Tony-Award-winning Broadway musical is often dark, despairing and always honest. However, the writing team has leavened these moments with humor. Without it, this show would be unbearably depressing. Furthermore, the moments of levity demonstrate that when you’re dealing with something as traumatic as mental illness, the ability to laugh is critical to daily survival. The writers don’t judge the characters and neither should we. At one point, Diana is undergoing electroconvulsive therapy. Meanwhile, Natalie is partying with her stoner boyfriend, Henry (a spaced-out, nervous but sympathetic Charlie Alguera). Natalie, lightheartedly, says her mother is in the hospital “being electrocuted.” The teenager (wonderfully played by Camryn “Cami” Handler) makes this remark in a flippant tone of voice. But again, people deal with traumatic life events differently. Credit Matherson for placing equal weight on pathos and humor. Toward the end, he especially deserves kudos for creating an aura of resiliency among these characters that will leave you gasping for breath. It will hit extremely close to home for so many. The plot revolves around a modern nuclear family which lost their baby son, Gabe, to an illness. As a result, his mother, Diana Goodman, has developed an illness suggesting a combination of Bipolar Disorder, Schizophrenia and Manic Depression. However, her doctor (a sympathetic, yet frank Ernesto K. Gonzalez) has a good point. Labeling a mental patient accomplishes little. If Natalie feels neglected, Gabe’s ghost reveals his own insecurities. On the one hand, he can be gentle and sweet. He refers to Diana as “mom” in such an innocent and vulnerable voice, you thinking you’re hearing a child. But while Gabe’s ghost (Christopher Alvarez in a multi-faceted, energetic performance) is comforting, he haunts, as in the vibrant, teasing song “I’m Alive.” It can border on torture for Diana. There’s almost a maniacal look on Alvarez’s face during the reprise. Gabe’s not out to torture anyone. But his sarcastic and sometimes nearly tormenting lyrics suggests how Diana’s condition is haunting her. Often during the musical, more than one character sings at her at the same time. The result is a feeling of someone pulling you in opposite directions, as though you’re a rope in a tug-of-war battle. There are many such moments in this musical, and they help create palpable dramatic tension and a dizzying sensation. Director Matherson stages tense scenes with skill. For instance, at one point, the other characters pass a seated, confused Diana from one person to another and spin her around. The show’s many contrasts suggest Diana’s topsy-turvy life. For instance, lighting designer Sierra Shreves’ diverse color palette creates a variety of appropriate moods, from depressing to happy. Speaking of such states, Matherson, who also designed the set and costumes, has created a vividly symbolic set. The top of the crumbling wall symbolizes the family’s deteriorating state. The wall’s top resembles a mountainous road, suggesting a turbulent journey through life. The peaks and valleys can serve as metaphors for a mental patient’s improvements and setbacks. This sense of lives crumbling contrasts nicely with the neatness of the Goodman home. The contents include a filled calendar, standing for Dan’s attempt to preserve a semblance of normalcy. The calendar is plastered onto the crumbling wall, creating tension between keeping things in order and the disorder enveloping the Goodmans. They are, essentially, freefalling, suggested by a seemingly bottomless expanse on the other side of crumbling wall. Appropriately, variations of “hold me” and “I’m falling” appear in Yorkey’s heartfelt, descriptive lyrics. Cast members, who have strong, expressive voices, sing impressively. Unfortunately, a five-piece band at times sounds so robust, they drown out the actors. There’s also a staging issue. Some scenes take place so far down-stage left, the actors are almost off-stage. This hinders the view of audience members seated way on the opposite side of the auditorium. But there are plenty more positives than negatives. Sabrina Lynn Gore’s Diana at times looks so confused, forlorn and unsteady, you fear she will keel over any moment. The pain etched into her face is hard to witness but believable. At other times, there’s a feral quality to Gore’s Diana that reinforces the urgency that she receive treatment pronto. Overall, it’s a well-rounded performance with raw emotion and smart acting choices. Gore’s performance, however, could use some more nuance at times. Johnbarry Green invests Dan with optimism and charm. However, it’s clear his wife’s condition is taking a toll. Angry outbursts and an intense look of concern on his face clearly communicate this. Handler deftly conveys Natalie’s many emotions, seamlessly segueing from irritable to sarcastic to concerned. The performance is blessed with impressive spontaneity and raw emotion. Combined with top-notch technical work, every well-thought-out gesture, spoken or sung word by the actors adds up to an emotionally-draining but powerful theatrical experience. This production reminds us how much attention mental illness needs in our society. In light of recent events, that has never been more true. 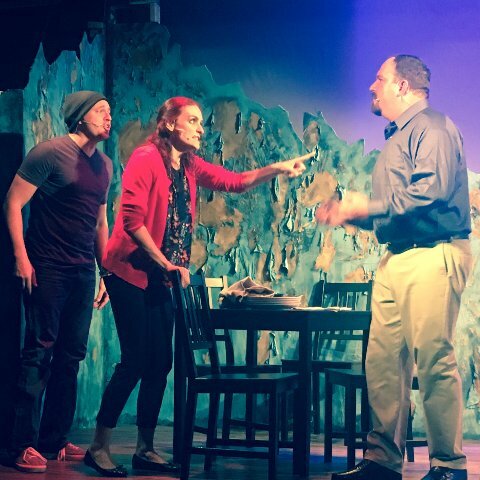 Next to Normal runs through June 3 at The Abyss Theatre, 2304 N. Dixie Highway in Wilton Manors. Show times are 8 p.m. Thursday-Saturday and 2 p.m. Sunday. Tickets are $39.50. Visit https://www.brownpapertickets.com/event/3389065 to purchase tickets. You can also visit http://www.measureformeasuretheatre.com or http://www.infinite-abyss.org.